Governments, like other large organizations, collect, produce, and distribute information. They generate statistical, demographic, economic, and geospatial information; and publish documents, such as laws, regulations, and executive orders, and other public records of legislative, judicial, and executive decisions and activities. During the print era, libraries acquired and organized these materials for use by researchers. CRL played an important role in this activity by preserving government publications and records not widely available elsewhere. Reports from a recent CRL webinar on how the new online distribution of information is changing the ways researchers access data from government agencies worldwide. Reports from the Charleston Preconference that brought together aggregators and republishers of government information with collection development specialists to discuss the new supply chain for government information. CRL President Bernard Reilly discusses the future of the evolving supply chain for government-produced information. 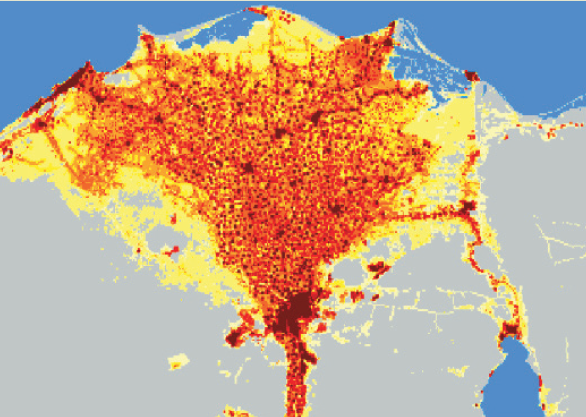 Cairo, Egypt, 2012 ambient population map, from the LandScan database. Courtesy of East View Information Services.